Franklin is a 2011 dark bay Oldenburg Premium gelding, with impeccable breeding! awarded a Premium Status, with flattering comments from the judges! selling for up to 750,000 Euros (For Romance)!!! International Quality dressage prospect, and huge jumper potential as well! 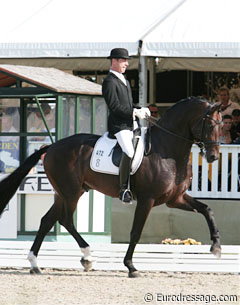 Fürst Romancier himself was main premium winner, became the most successful stallion of his age group at the World Championship for five-year old dressage horses in 2009, and at the Bundeschampionat he placed second in the qualifier for the final with a score of 9.0 and placed fourth in the final as he did at the World Championship for young dressage horses. In his stallion performance test, he has received top scores all higher than 9.0 for his basic gaits as well as 9.0 and 9.5 for rideability. Meanwhile, he has matured to advanced (S) classes. The sire, Fürst Heinrich, was himself World Champion for young dressage horses and produced, during his short period in breeding, outstanding horses like the 2011' World Champion for young dressage horses, Woodlanders Farouche. Fürst Romancier originates from the valuable dam line of Edoste represented by Bundeschampion and competitor of the European Championship Exupéry, Vice Bundeschampion Landjuwel Gold, Olympic horse Petit Prince/Ellen Bontje and Grand Prix winner Avignon (German Champion with Thomas Schmitz). The big-framed and absolutely significant Fürst Romancier made a double sensation in the season of 2011/2012: At the 2011' Oldenburg licensing he presented the Champion Stallion, For Romance, who was auctioned for a sensational price of 750,000 Euro, and in summer 2012 with its full sister Fasine, the Champion Mare at the Oldenburg Elite Mare Show in the Schlosspark of Rastede. In 2011, he presented another premium stallion, namely the today's Celle State Stud sire Fürstbischof, selling for 170,000 Euro. Meanwhile, the number of licensed sons has increased to twelve. As well in 2012, Fürst Romancier presented with Favoloso (Neustadt/Dosse) and Fürst Larino (Vechta) anew several premium stallions. His progeny, which is really successful in tests for youngsters, placed Fürst Romancier right away among the best German dressage sires according to FN's estimated breeding value statistics.